I have spent ZERO minutes looking for my keys in 2012. Why? Because I have a fancy dish near my front door that my keys live in when they’re not on my person as I wander the streets of NYC. I set them in the dish upon entering my home and scoop them up when I leave. There is no cursing while searching frantically in couch cushions which makes for a smooth exit. I keep my metrocard holder, laundry card, and gym card there too. And any out-going mail gets tucked under the fancy dish so I remember to take it with me when I leave the next morning. When something has a place, it’s easy to find it! 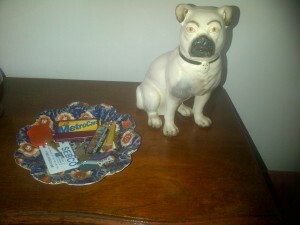 It also helps to have a porcelain guard dog beside the key dish. But that’s just my personal taste. What does your key dish look like? And what do you keep there? Leave a comment below.